Guides to Searching Grey Lit - Grey Literature Resource Guide - LibGuides at Norris Medical Library . . . Links to databases, search engines, and websites to some of the more commonly searched grey/gray literature in the health sciences. This guide contains links to databases, search engines, and websites relevant to some of the more commonly searched types of grey/gray literature in the health sciences: policy positions, reports, briefings, evaluations of programs, white papers, clinical trials, regulatory information for drugs and medical devices, grants, theses & dissertations, conferences, documents from professional organizations, and statistics. Click here for a comprehensive list of grey literature document types. It is benefical to search the grey literature when creating comprehensive health care documents such as guidelines, systematic reviews, and meta-analyses, as the information contained in such documents can provide a broader perspective which is useful in reducing bias. Since much of grey literature is unpublished or published through non-commerical avenues it can be difficult to find. For detailed guidance on how to search the grey literature, please see the guides listed in the box to the right. Resources listed in this guide are freely available, unless otherwise noted. 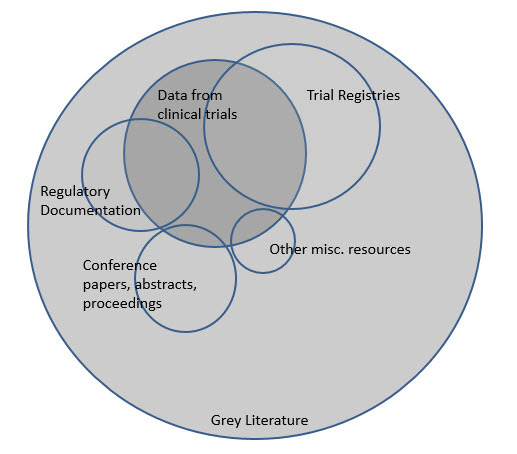 The resources below provide detailed guidance on how to approach searching grey literature. Cochrane handbook guidelines to searching grey literature. Paynter provides a checklist of resources searched by librarians when conducting a systematic review. Three specific categories are covered: regulatory information, trial registries, and abstracts & conferences. Slide Presentation from the AHRQ 2011 Annual Conference that provides guidance on where to look and what to look for. Download the AHRQ Methods Guide for Finding Grey Literature Evidence. Provides guidance as to which resources to search and how often. Dean Giustini's manual includes links to resources and a systematic approach to searching grey literature.